I loaded an Acronis Drive Monitor and now every time that I switch my computer on a message comes up saying, " Some of your discs reported a warning status. Check to see more." When I check the appropriate section states, " No critical events detected." Obviously a bit dark out there so I'll look for a different system where I can get advice. It takes time for people around the world to catch up with posts, and Acronis don't look in here that often, I presume because the software is free. Anyhow, a little more information is needed. What brand and type of drives do you have? 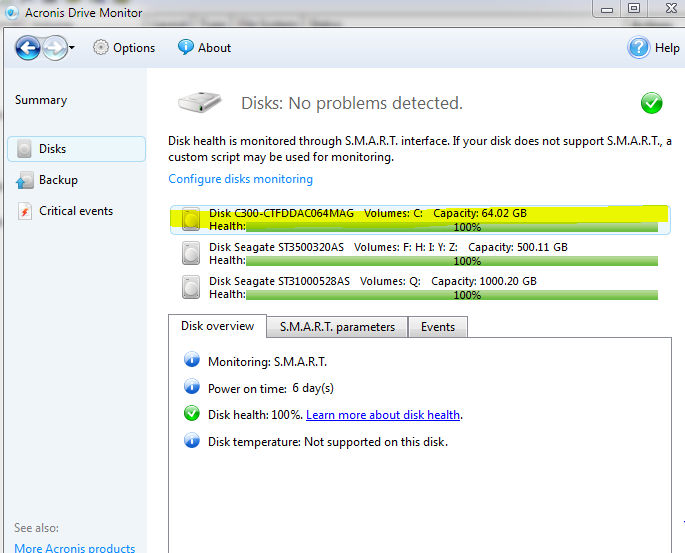 When you click on the drive(s) are there any SMART parameters that show yellow. It might be that the disks are a bit slow in reporting themselves or it could be a false positive (if there are no other indications). Does anything show up in Windows Event Manager? Do you have either True Image or ABR10 installed? My apologies for my impatience. I regret that I am not very technically competent so although I know that I have two hard discs and one external hard disc I do not know how to identify which brand and type of drive they are. I am afraid that I do not know how to click on the drive(s) to see if there are there any SMART parameters that show yellow. I did look at the Norton system advice thing but there was no yellow on them. I looked in Windows Event Manager and could see no obvious problem. I'm afraid I do not know what True Image or ABR10 are. However, another message came up when I switched the computer on. Discs: Warnings detected critical events: High risk events. Backups collecting data. I wonder what that means or would I have been better of not to have loaded the Drive Monitor? 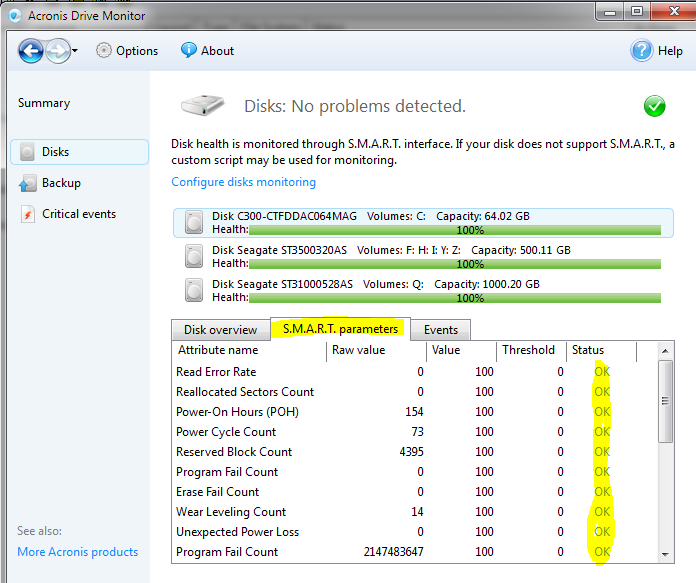 With ADM (that is Acronis Drive Monitor) open - the disk list should give you the names and size of your drives. Select the drive you wish to look at by clicking with the left mouse button in the top panel on the drive name in question. Then click on the SMART parameters tab, see if any of the parameters listed in the bottom panel have a status reported in yellow or red for that matter. If Windows Event Monitor reports an NTFS event 57 then this could be anything. Even Microsoft have problems deciding what this event code means. Maybe the forums named True Image or ABR10 or the Acronis webpage would point you in the right direction as to what these programs are.